The Kassam Stadium is situated in the Science Park towards the South East of the City. It is well signposted from the major routes but these are not necessarily the shortest routes. The simplest route from High Wycombe is to take the M40 West and then branch off on the A40 towards Oxford. At the Headington roundabout take the A4142 towards Cowley and then follow the football signposts. Alternatively you can go via Stadhampton and turn left when signposted as you approach the Cowley area. The ground has a huge car-park but it's about as quick to get away from after the game as Adams Park. If you decide to park in the neighbouring roads, look out for matchday parking restrictions. Train: Nearest station Oxford but it's three miles from the ground on the other side of Oxford city centre. Connections from Wycombe are bordering on the ridiculous making private, supporters club or public coach transport the better option. If you insist then the No.601 bus apparently runs from the station via the City to the Stadium. Wycombe first met the team now known as Oxford United in 1951. 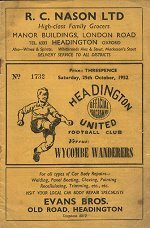 United, then called Headington United, met The Wanderers in the 2nd Qualifying Round of the FA Cup and despite Wycombe losing, it was The Wanderers who progressed to the next round because United had fielded an eligible player. However, United got their revenge the following season when they triumphed 6-2 in front of a record FA Cup crowd at The Manor Ground of 9,900. Trevor Aylott - Former trainee with Chelsea - making his senior debut in 1977 and going on to made 29 League apps while at Stamford Bridge. Went on to play for Barnsley, Millwall, Luton Town, Crystal Palace, Bournemouth and Birmingham City befor time with Oxford United during the 1991/92 season (37 apps, 6 goals). Ended his Football League career at Gillingham (10 apps - 2 goals) and joined Wycombe on loan from The Gills in March 1993 - making three Conference appearances wearing his distinctive headband. Dannie Bulman - Made close to 250 First Team for the Wanderers following a £10,000 move from Ashford Town in July 1998 - making his debut as 19 year old at Adams Park and scoring with his first touch. Moved to Stevenage Borough in the summer of 2004, before further moves to Crawley Town and then on to Oxford United in the summer of 2009. Nick Cusack - Midfielder who spent a loan spell with Wycombe from Oxford United in March 1994, scoring one goal in four games under Matin O'Neill. Joined Fulham in November 1994 following a two year spell at The Manor Ground. Later moved to Swansea City, where he clocked up more than 200 appearances. Started his pro career with Leicester City, Peterborough United, Motherwell and then Darlington before signing for United in 1992. Scott Davies - Midfielder who made 23 loan appearances at Wycombe while at Reading. Became Gary Waddock's first signing for Wycombe after taking the job at Adams Park in October 2009 - staying at Adams Park for a three month loan spell and making 15 League apperances. Made 4 loan appearances for Yeovil Town later that same season before returning for a second loan spell with Wycombe in September 2010. Released from Reading at the end of the 2010/11 season and joined Football League newcomers Crawley Town. Signed for Oxford United on a non-contract basis in March 2013 by Chris Wilder. Made 20 League appearances for United before he was released at the end of the 2013/14 season. Michael Duberry - Central defender who begain his time with Chelsea before a £4.5m move to Leeds United in July 1999. Made 57 League appearances for Leeds over the course of six seasons before switching to Stoke City and then onto Reading. Signed for Wycombe in the summer of 2009 following his release from the Royals. Made 19 First Team appearances for Wanderers before being released by 'mutual consent' in February 2010. Went on to play for St Johnstone in Scotland before joining Oxford United in June 2011 on a two year deal. Made 50 appearances before he was released at the end of the 2012/13 campaign. Played briefly for Hendon before retiring from the playing side in October 2013. Chris Hackett - Winger who appeared on loan for Wycombe during the 2011/12 season while on the books of Millwall. Originally with Oxford United where he made close to 150 apps in a seven year spell before a brief spell north of the border with Hearts. Moved to Milwall in August 2006. Made five League apps for Exeter City in November and December 2011 before spending the remainder of the season at Adams Park, making 8 League appearances. Moved to Northampton Town in the summer of 2012 where he had totalled more than 100 appearances by the end of the 2014/15 campaign. Steve Hyde - A knee injury ruined this 1960's youngster's chance of fame in the professional game. At 16 years and 9 months he was the youngest ever player to appear in a senior game for Wycombe until Kevin Keen took the honour some 22 years later. Tried his luck with United during 1964-65 season - making 9 appearances. Paul McCarthy - Former Brighton defender who made over 250 appearances for the Wanderers during a six and a half year spell at Adams Park. Moved to Oxford United in the summer of 2003 following a short period on loan. Lewis Montrose - Made 55 appearances for Wanderers in a two year spell under Peter Taylor having signed from Wigan Athletic in the summer of 2009. Followed Peter Taylor to Gillingham in the summer of 2011. Made five League loan appearances at Oxford United during the 2012/13 season before a move to York City in the summer of 2013. Moved to Conference North side Stockport County in the summer of 2015. Dean Morgan - Well travelled striker who signed for Wycombe in September 2012 from Chesterfield in what turned out to be Gary Waddock's last permanent signing as Wanderers Manager. Had made 10 appearances on loan for Oxford United towards the end of the 2011/12 season while still at Chesterfield. Scored 15 times in 57 League games for Wycombe before switching to Woking at the start of the 2014/15 campaign. Started his senior football with Colchester United in the 2000/2001 season. Other clubs include Reading and Luton Town. Josh Parker - Striker and former Queens Park Rangers youngster who played briefly on loan with AFC Wimbledon in the Conference in January 2010 before making his R's debut later than season. Move on loan to Wycombe in November 2010 and debuted as second-half substitute (against Torquay United) before a stress fracture to his left foot, while on international duty with Antigua and Barbuda, cut short his loan. Left QPR at the end of the 2010/11 season following their promotion to the Premier League, having made 5 First Team apps. Went on to play for Oldham and Dagenham & Redbridge (loan) before a move to to Oxford United in December 2012, making 16 League appearances before moving to Slovenian side Domžale in June 2013. Josh Payne - Midfielder who made three League appearances and scored once for the Wanderers during the 2010/11 season while on loan from West Ham United. Switched to Doncaster Rovers in the summer of 2010 but was loaned to Oxford United at the end of August 2010 and the deal was eventually made permanent. Moved to Aldershot Town on loan in January 2012, with the deal being made permanent in March 2012. Jon-Paul Pitman - Striker who originally joined Wanderers from then Conference side Crawley Town in January 2009. Scored 17 times in 82 appearances before switching to Oxford United in the summer of 2011 - scoring 5 goals in 30 League appearances. Spent time back on loan at Crawley during the 2011/12 season before returning for a second spell at Wycombe in 2013/14 under Manager Gareth Ainsworth. Joined Grimsby Town in the summer of 2014 following his release from Wanderers. Jason Seacole - 70's idol at United - played for Wycombe in the mid 1980's, scoring 14 times in 56 appearances. Sam Stockley - Spent just over a year with United having switched from Barnet in July 2001. Left United in October 2001 for Colchester United having previously spent two months at Layer Road on loan. Moved to Wanderers in July 2006 on a free from the Essex Club - making 65 appeances before opting to join Port Vale in the summer of 2008. He subsequently moved to Hungarian side Ferencvárosi TC in a player/coach role. Sam Togwell - A former Crystal Palace trainee who made four loan appearances for United during the earlier part of the 2004/5 season. Went on to have permanent spells with Barnsley and Scunthorpe (more than 150 apps) before moving to Chesterfield in July 2012. Made four loan appearances for Wanderers from The Spireites towards the end of the 2013/14 season but perhaps best remembered for being sent-off on his debut away to York City. Switched to Barnet in the summer of 2014 following his release from Chesterfield. Richard Walker - Spent three months on loan at Wycombe from Aston Villa during the early part of the 2001/2 season. Scored four goals in eleven games for Wanderers before opting to join Blackpool on a permanent basis in preference to Wycombe. Loaned to Oxford from Blackpool during 2003/4 and eventually joining on a free on transfer deadline day. Joined Bristol Rovers at the start of the 2004/5 campaign. Guy Whittingham - Striker who spent a short spell on loan at United from Portsmouth during the early part of the 2000/2001 season. Joined Wycombe on transfer deadline day the same season during Wanderers famous FA Cup run. Best known for his time at Pompey where he had two spells, making more 200 appearances. Other clubs include Aston Villa and Sheffield Wednesday. Chris Zebroski - Swindon born striker who has a short spell on loan at United during the tail end of the 2006/2007 season while he was on the books of Millwall. Originally made his Football League debut while with Plymouth Argyle. Joined Wycombe in the summer of 2008 for £20,000 from Millwall following a season on loan with Torquay United in the Conference, where he scored 18 goals in 46 appearances. Scored 9 goals in 55 apperances for Wycombe before a permanent moved back to Torquay in the January 2010 transfer window. Also: Former United defender Graham Adams spent the 1960/61 season as Coach at Wycombe.